Hello Readers, We are back with a new loot from Nearbuy and Freecharge. 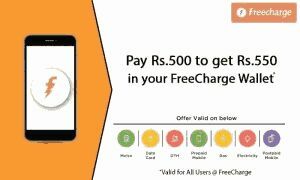 This time you need to pay Rs.500 on Nearbuy Using Freecharge and you will get Rs.550 Voucher and You can add money through this coupon on Freecvarge. 2. Add the Product in the cart and purcahase it. You can use Payumoney as payment method to get 1℅ Off. You are done. You will get your Freecharge Voucher soon in your mail or inbox. 1. Go To Freecharge Website or Download the Freecharge App. 2. Select Mobile Pre-Paid / Mobile Post-Paid Bills / Utility Bills / DTH / Data Card / Metro Mumbai. 5. Enter Your Nearbuy Coupon ( You Got In E-Mail ) and Select ” Redeem Now ” and pay the remaining amount. Viola! You had Got Rs.550 Off On Your Recharge Or Bill Payments.